The POGIL Project itself is a great community of transformation that is very positive, accepting, and supportive. Faculty developers will benefit by learning more about this particular evolution of active and guided inquiry learning, and enhancing our ability to serve as a resource. Teachers will benefit by learning about themselves, their students, constructivism, and how to think about their content and pedagogy. My favorite part of attending and facilitating these workshops is that I get to have a lot of positive conversations with a variety of people about teaching and learning. What is a POGIL workshop? The POGIL® project offers a unique blend of teachers at both the secondary and post-secondary level the opportunity to collaborate together. POGIL® workshops create the sharing of ideas and resources across levels in a comfortable setting that helps foster connections that typically would not be made otherwise. Are you already familiar with basics of POGIL, perhaps you would like to learn more about writing your own POGIL activities in the activity writing track or perhaps you are looking to add more inquiry to your labs and can take the lab track, or perhaps you are experiencing difficulty as an instructor or have never received any formal training and would like to gain support through the facilitation track. Where and When are the Workshops Being Provided? Workshops will be offered at various locations across the country this summer. In the Northeast the location will be Simmons University in Boston, MA from July 16-18. In the Northwest the conference will be running from July 30th through August 1 at Lewis and Clark College in Portland, Oregon. In the Southwest Vanguard University in Costa Mesa, CA will host the conference from July 23 through the 25th. Finally, the North Central period will host one in Columbus, OH from July 22 through 24. Each of these workshops cost $450 and include registration, materials, three lunches, and two dinners. On-campus housing is available for an additional fee which would also include breakfast. Two quarter graduate credits can also be obtained through Seattle Pacific University for an additional fee. Please check out the POGIL website to register. What conference track is best for me? Compare the conference tracks in table 1. What if I have already completed a POGIL regional workshop? If you have been using POGIL activities in your classroom and would like to apply your knowledge and skills in new and innovative ways, consider attending the National Conference for Advanced POGIL Practitioners (NCAPP). At the NCAPP conference teachers come together to share new ideas, get targeted feedback, engage in in-depth discussions, interact with a diverse community of teachers, and gain a deeper mastery of the POGIL approach. Attendance at the National Conference for Advanced POGIL Practitioners is by application. All conference participants actively contribute to the planned program. Therefore, in addition to basic information about you and your POGIL experience, the application provides opportunities for you to summarize any work you would like to present in any of the various types of sessions. Applicants invited to attend the conference are also notified of accepted presentations. The next NCAPP will take place June 24-26, 2019 at Washington University in St. Louis. Registration is $500 and includes lunches and dinners. On-campus housing is $225 and includes breakfasts. Limited scholarships are available for NCAPP attendance. What if I would like to write my own activities? The Writers' Retreat will provide an opportunity for individuals or small teams to spend focused time on developing, writing, and improving POGIL activities with the mentorship of experienced POGIL author coaches. The 4-day agenda includes workshop sessions focused on activity authoring, feedback sessions, and ample time for writing and interacting with other authors and author coaches. The retreat is appropriate for authors in all content areas at both post-secondary and K-12 levels. If you have an interest in authoring high-quality POGIL activities, if you have already authored activities and would like to refine them, or if you are getting activities ready to submit for endorsement, the POGIL Writers' Retreat is a great opportunity for you to get feedback from colleagues and author coaches. This year's Writers' Retreat will take place July 29-August 1, 2019 at Johns Hopkins University, Baltimore, MD. (Check in on Sunday, July 28. Check out on Thursday, August 1). Applications will be accepted until April 2 and applicants will be notified of acceptance by April 16. Attendance is limited and by application only. The cost of the Writers' Retreat is as follows: $575 registration (includes all materials and four lunches.) $275 housing (includes four nights and four breakfasts.) Dinner will be on your own. For an additional $165, you can register for 3 quarter graduate credits from Seattle Pacific University. Can POGIL provide a conference for my institution? For a fee, the Project will also provide additional workshops in your area, depending on availability of facilitators. If you have a specific date in mind, please enter that when you submit your request. We can also work with you to design an ongoing POGIL experience over the course of a year. Please contact Marcy Dubroff in the National Office for more information at marcy.dubroff@pogil.org. 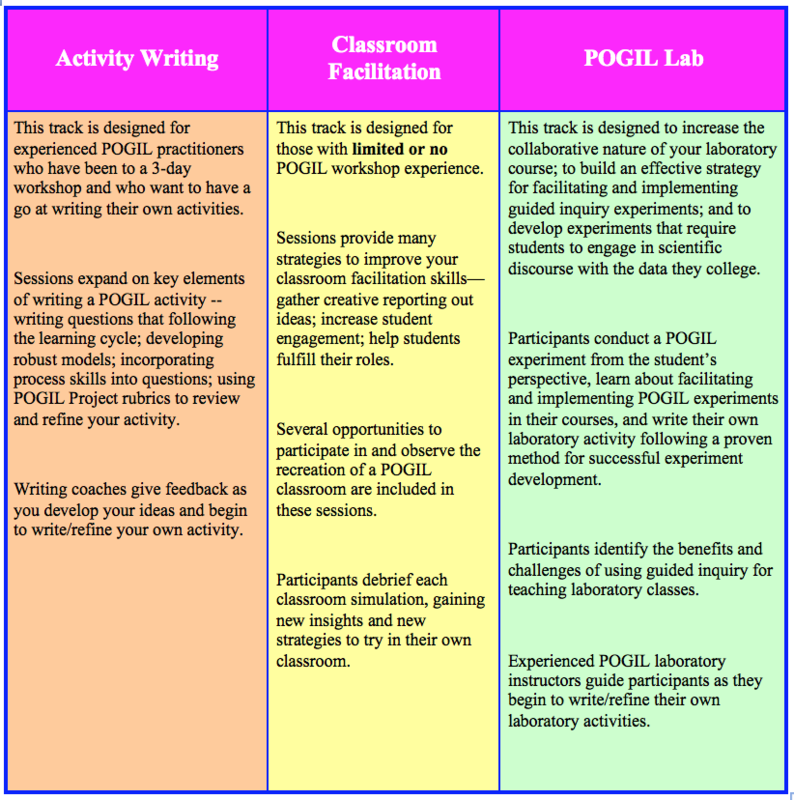 POGIL workshops often work well as professional development days or if you are seeking a meaningful teaching and learning experience for your faculty. You may request additional workshops in your region using this form, or you may request one of the other ways The POGIL Project might be of service to you. Feel free to contact The POGIL Project or myself with questions. Hope you can attend one of these awesome professional development experiences!